Through time, the Earth has changed its rate of rotation, and days have become longer. This extraordinary discovery has come from detailed analysis of the growth bands on coral epithecae. Well-preserved corals often display fine growth lines, grouped together into thicker bands; the former are thought to reflect daily growth while the latter bands are monthly growth cycles, controlled by the lunar orbit. A set of more widely spaced bands may represent yearly growth. 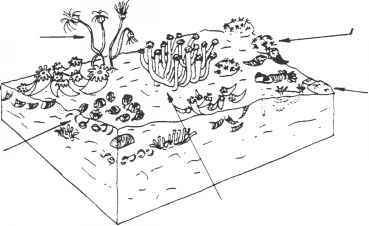 In a classic study, John Wells of Cornell University counted the growth lines on a variety of Devonian corals (Fig. 11.33) and suggested that the Devonian year had about 400 days. The implication that Devonian days were shorter suggests the Earth's rate of rotation is decreasing due to the gravitation pull of the moon. Ivan Gill of the University of New Orleans and his colleagues (2006) have taken the story much further. Using a range of more sophisticated techniques, including the scanning electron microscope and backscattered electron imaging, it is now possible to identify with much more precision microscale banding in some coral species that could ultimately act as proxies for daily changes in our environment, highlighting short-term climatic and other events. Moreover, this style of banding can help decipher a great deal more about the detailed mechanisms and timing of skeletalization within the corals as a whole. long and up to 300 km wide and visible from space. It is a long-lived structure dating back to the Miocene. The reef extends from 9° to 25° south and comprises many multicolored scleractinian corals together with many other invertebrates and calcareous algae. The fore-reef deposits tumble eastwards into the western Pacific; landward back-reef lagoons are developed against eastern Australia. Can such reef constellations really be recognized in the fossil record? On the adjacent continent the Upper Devonian rocks of the Canning Basin contain fossil barrier reefs dominated by calcareous algae and tabulate and rugose corals together with stromatoporoids and microbiolites. The reef and its associated facies can be mapped in considerable detail, as the Windjana Gorge dissects the near-horizontal strata of the northern margin of the Canning Basin (Fig. 11.35). An unbedded core of calcareous algae, corals and stromato-poroids sheltered a back-reef and lagoonal environment packed with calcareous algae, corals, stromatoporoids and crinoids together with brachiopods, bivalves, cephalopods and gastropods. In front the fore-reef was steep and littered by reef talus. However, during the Late Devonian extinction event, at the end of the Frasnian, associations dominated by rugose and tabulate corals together with stro-matoporoids disappeared; this type of reef ecosystem never recovered. Although some coral-like forms have been described from the Cambrian, most lack typical zooantharian structures. Cothonion, for example, with poorly integrated corallite-like clusters and opercula was probably a Cambrian experiment with coralization (Fig. 11.36). The first tabulates appeared during the Early Ordovician with cerioid growth modes; tabulae were rare and septa and mural pores were absent. 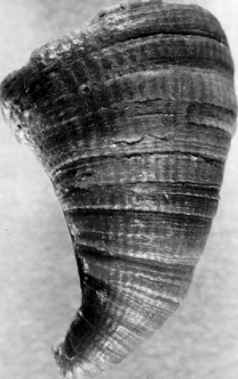 Nevertheless, by the Mid and Late Ordovician the more typical characters of the Tabulata had evolved when they dominated coral faunas. Some workers have removed the heliolitids, with individual coral-lites mutually separated by extensive coenos-teum, from the Tabulata, as a distinct order. The group was common until the Early Silurian when the more open structures of the favositids with massive cerioid colonies began to dominate, although they were already abundant in the Ordovician. The Rugosa appear during the Mid Ordovician. Many of the evolutionary trends across the order have been repeated many times in different families. In general terms the group evolved more complex, heavier skeletons prior to extinction at the end of the Permian. 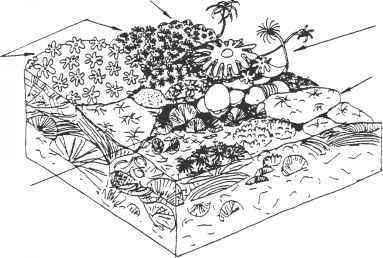 building and non-reef-building groups in shallow- and deep-water environments, respectively. Scleractinian evolution was marked by a number of morphological trends: solitary life strategies were eventually superseded by a dominance of colonial forms that display transitions from low levels of integration in phace-loid growth modes to higher levels in meandr oid styles, common in modern reefs. Corals have been used effectively for the correlation of Silurian (tabulates) and Devonian (rugose) strata but they have been proved most useful for Carboniferous biostratigra-phy. 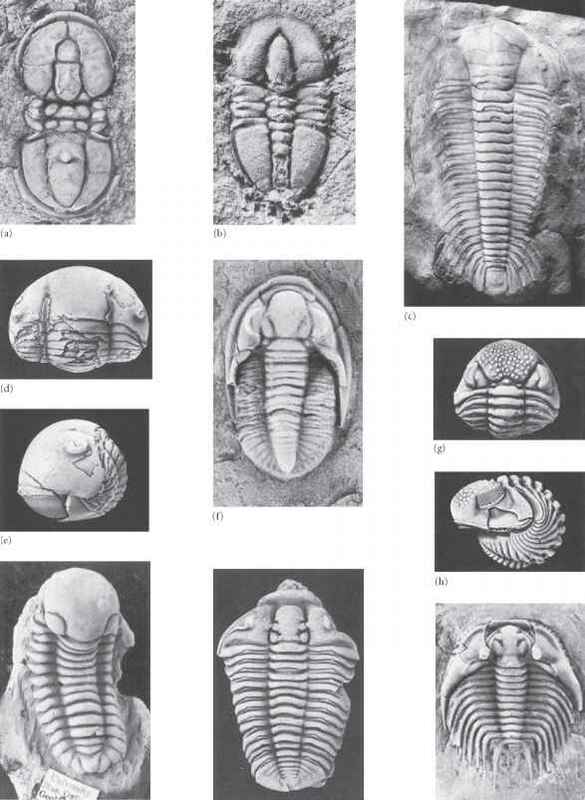 During the early 1900s, Arthur Vaughan studied in detail the distribution of Lower Carboniferous corals in Belgium and Britain and he argued they would be of great value in Carboniferous biostratigraphy. Corals are very common, often widespread, usually distinctive, and well preserved in the Lower Carboniferous rocks of Europe. However, more modern studies on Carboniferous biostratig-raphy using microfossils such as conodonts and foraminiferans, together with sequence stratigraphy, have shown that the occurrences of corals are controlled as much by rock facies as by time, and so they cannot be used for global correlation. Nevertheless, many corals are still useful for local correlations, and Lower Carboniferous stratigraphy (Fig. 11.37) has been refined on the basis of Vaughan's pioneer work and more modern techniques (Riley 1993). But was coloniality amongst the bilaterians a derived condition or, more controversially, a primitive state (Box 11.10)?